The young woman lays on fur background. Cartoon strong gin coming out of a magic lamp flat vector illustration. Kids superheroes on white background. 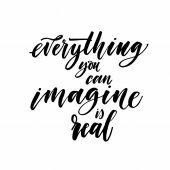 Imagine everything you can is real postcard.